Developed by indie artists Ohm & Sport, the app would play songs on endless 30-second loops. Taylor Swift’s impassioned missive for Apple to pay artists for streaming their music during three-month trials of Apple Music caused Apple to beat a swift retreat , earning the pop princess plaudits for selflessly championing the indie cause. The New York-based ambient pop act Ohm & Sport, however, were unimpressed. Wait, Ohm and who? 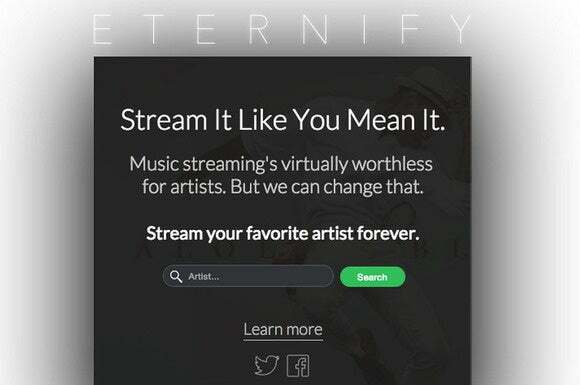 The band has been all over the Internet recently for developing Eternify, a web app that allowed people to artificially inflate their favorite artists’ Spotify earnings by playing songs on endless 30-second loops. Artists earn a pittance from streaming—anywhere from $0.006 and $0.0084—each time a subscriber plays one of their songs for 30 seconds or more. Alas, the gravy train was short lived, as the streaming service blocked the app from using its API (application program interface) yesterday. The outfit told the BBC that people leave a large number of artists with small, insignificant sums by using on-demand streaming services like a radio station. It feels listeners should focus on fewer artists. On being asked for their thoughts on Taylor Swift’s activism, the band dismissed her recent actions as “theatrics” that have done little to alleviate the plight of smaller artists. Why this matters: It could be argued that Ohm & Sport is applying a double standard in criticizing Swift, as the band just launched a new album and all this publicity should raise their profile. But few would argue how difficult it is for most musicians to earn a living when they’re compensated for their work at such miserly rates.